Welcome to Commander Month, a month dedicated to the greatest format that one can play as a magic player. 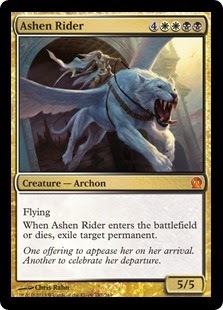 Today, I will be covering The great god Athreos, who helps the dead of Theros pass to the realm of Erebos, unless of course you know the price to pay. There are some restrictions that we have decided to put upon ourselves when building these decks to help limit the price of these decks and make it easier for any regular FNM player to build. The big rule is that every single card in this deck has to be legal in the Return to Ravnica, M14, Theros, and M15 Standard environment. Now, with great glory, may I present to you a deck devoted to the God of Passage. How This is Just Not a B/W Deck. When I went into this project, I had two options to make this deck: I could just jam all the best Black and White cards from Standard into the deck or I could try to take advantage of the amazing ability that Athreos has at his disposal. With his ability to recur creatures (at the help of a nice political move on an opponent or due to a low life opponent), enter the battlefield (ETB) effects can lead to good value letting you grind the game out of your opponents. 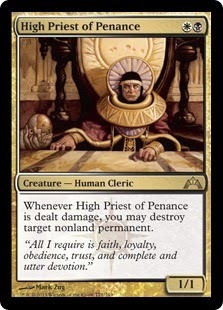 This decklist has many examples of 187* creature, such as Ashen Rider, Shadowborn Demon, and High Priest of Penance, that will grind out your opponent and help you win in the almighty card advantage. Card Advantage does have many mediums to show itself, when you think of Black and card advantage you may only think of all the wonderful kill spells that are at black disposal. 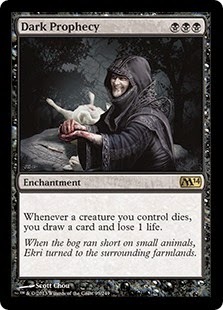 Though one lesser known source of card advantage in Black is to draw cards with some payment of life and this deck loves using it to its fullest extent, from creatures like Bad Bob (Pain Seer) to utility enchantments like Underworld Connections or Dark Prophecy. 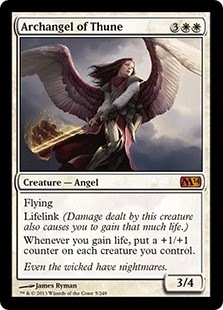 While you may have to pay life to reap the benefits of this card draw, it is easy to cancel that out with plenty of creature with lifelink, most notably Archangel of Thune. This deck is not just 187 creatures and wonderful card advantage (that would be the dream): sometimes you just need filler and value cards. 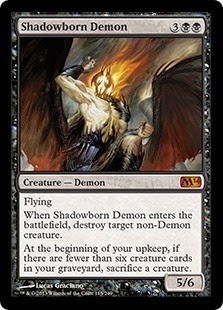 Some cards such as Elspeth, Sun's Champion are just the best cards this deck had available to it. Then there is Soul of Theros which lets you topple over a defeat after playing Elspeth, recurring some Xathrid Necromancers, or having a mighty cat army from Brimaz, King of Oreskos. It is time for this article to end, so see you next week for a continuation of Commander Month. Thank you, and don't forget to brew. NOTE: I switch between ETB (enter the battlefield) and 187, which do mean the same thing, though ETB is better used when referring to an effect and 187 is best for creatures (Examples: "That creature has an ETB effect," and "It is best to have some 187 creatures in your deck."